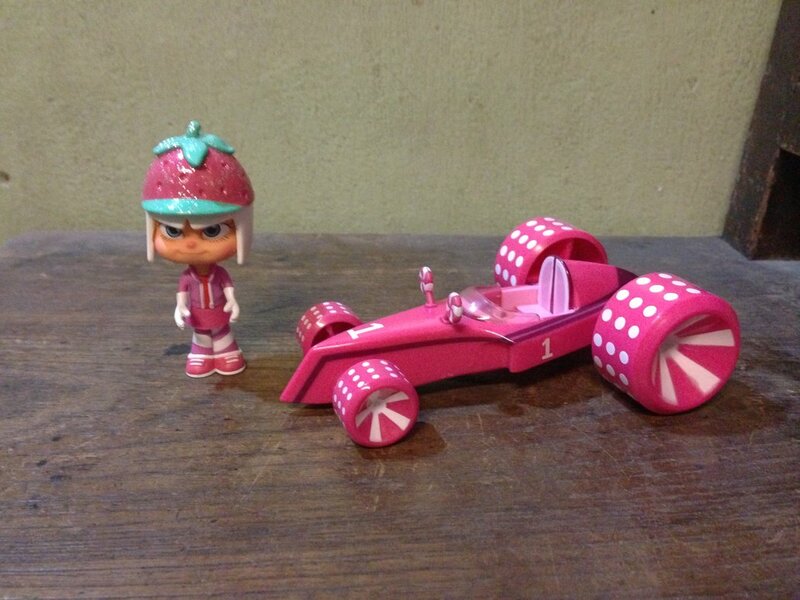 We've been looking for Wreck-It Ralph tie-in toys for a while, and it looks like a few are slowly leaking out onto the UK Market. Argos now sell three of the superb Thinkway Toys racing karts from the movie's 'Sugar Rush' segment, including the two we bought. 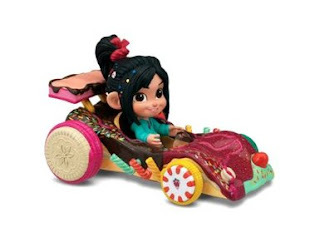 Vannelope Von Schweetz's fantastic hotch-potch go-kart is super-detailed, and comes with a posable Vannelope figure which 'plugs in' to the kart, so when kids are driving the kart around the floor like mad things (as Princess C has for most of yesterday and today) the figure stays put. A good feature. Decorated just like her kart in the movie, it comes with biscuit wheels, wafer spoiler and lots of tiny little details. The wheels are free-rolling and it's a nice robust toy for even the roughest toughest playtimes. 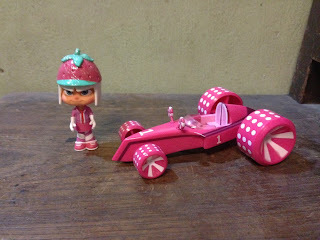 Though she's the 'bad girl' in the movie, Charlotte actually preferred Taffyta's car (probably because it's so shockingly pink). It's a bit of a shame that Argos only sell the three racers (the third is The Swizz / Tongue Twister) as Thinkway and other manufacturers have put together some fantastic toys to compliment the movie. With the blu ray and DVD release coming up in UK territories, we might see a few more toys arriving - but so far, the only way to get them seems to be to hunt online where prices can be extortionate (both these karts were £12.99 each in Argos which isn't cheap but they're very good quality products).